Ein intensives und spannendes Wochenende mit zwei Komponenten erwartet die Tangoliebhaber bei Siempre Tango in Karlsruhe. Neben einer Reihe von Milongas mit international renomierten DJs, bieten Sebastian Arce und Mariana Montes zum ersten Mal ein 10-stündiges Seminar über zwei Tage für fortgeschrittene und erfahrene Tänzer zum wichtigen Thema Musikalität in Tango, Vals und Milonga. Das Seminar ist beschränkt auf 15 Paaren. 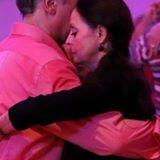 A highly exciting and intensive tango weekend is awaiting tango lovers by Siempre Tango in Karlsruhe. The weekend comprises two components. in addition to a series of milongas with international highly regarded DJs, to the first time, the famed and internationaly highly acclaimed meastros Sebastian Arce und Mariana Montes will deliver over two days a 10-hours seminar on the extremely important topic of ''Musikality in Tango, Vals and Milonga''. The seminar is meant for advanced and experienced dancers and is limited to 15 couples only. The mastery of Sebastian and Mariana of all stiles of tango is astonishing and the musicality of their dance, especially that of vals and milonga ist second to none. In short, both are qualified like no others to lecture on the topic. Not to mention that Sebastian and Mariana are known to be excellent teachers. From own experience we can warmly recommend the seminar. In addition Mariana offers for all levels a 3-hours Seminar on ladies technique. all milongas: 35 € p.pers. Seminar 1: 55 € p.pers. Seminar 2: 230 € p.pers. Seminar 1 & 2: 260 € p.pers. Seminar & milonga package: 280 € p.pers.